You can view more pictures in our historical archive photo gallery. The main catalyst for the establishment of the Greenfield Fire District in Saratoga County NY was the burning of Cliff Stevens’ home and garage located on Maple Avenue near what is now the Saratoga Medical Building (across from Sarge’s triangle diner) in 1946. Since this house is technically outside the Saratoga Springs Fire Department’s district, they could not respond due to insurance reasons and Cliff Stevens’ home was left unattended and was lost. Knowing that fire protection in the Town of Greenfield and Wilton was contingent entirely upon “Bucket Brigades”, Wilton resident Windsor G. Cote organized a public meeting on March 17th, 1947 with County Attorney John W. Nichols. Residents were present from the Maple Avenue, Middle Grove, Porter Corners and Greenfield Center districts and Paul Eddy made a motion to approve Attorney Nichols to prepare a petition for circulation for the formation of the Greenfield Fire District. This motion was seconded by Henry Menshausen of Middle Grove and unanimously adopted. Board of Fire Commissioners: Charles W. Scott, Chairman; Henry Menshausen; Guy Hale; Virgil Brigham; and Byron Gorham. Secretary-Treasurer: Clayton H. Brown. 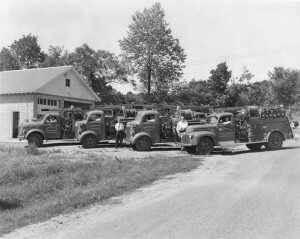 District Fire Chief: Windsor G. Cote; Assistant District Chiefs – Joe Doherty (later declined, replaced by Jarvin Rowland), Richard Roeckle, Paul Eddy and Vincent J. Smero, Sr.
On October 14th, 1947, the district held a mandatory referendum to purchase equipmend and build fire stations. The bond issue specified $20,000 for equipment and $15,000 for fire buildings and was approved. Company #2: Captain Jarvis Rowland; First Lieutenant Joe Burton; Second Lieutenant John Jones; Third Lieutenant Hilliard Young, Sr.
Company #4: Captain Paul Eddy; First Lieutenant John Freebern; Second Lieutenant Clifford Stevens; Third Lieutenant Dennis Ryan. In December, at the first annual Fire District meeting, the following Commissioners were elected: Henry Menshausen (five year term), Charles W. Scott (four year term), Byron Gorham (three year term), Guy V. Hale (two year term) and Virgil Brigham (one year term, replaced in Jan. 1948 by Floyd Menshausen). The early years of the district were consumed largely by brush and chimney fires. The annual total of fire alarms in the early years of the company totaled in the neighborhood of thirty calls, presently Maple Avenue averages over fifty per month. The majority of the district back in the fifties was farm land, now the district has a very high percentage of commercial real estate including the Exit 15 corridor, I-87, a large amount of railroad, Route 9 and Route 9N. The first fire stations were either old converted school houses or old barns that were given to the district. The individual fire company members added on to their facility, building the additions themselves. For example, in the early sixties the Maple Avenue Fire Department a large meeting hall was built by the members of the company which would serve as a location for turkey and spaghetti dinner which the company used to raise funds for new equipment. In the early 1970s, the Porter Corners fire department built and replaced a new roof over their firehouse. Even today this trend continues: the Maple Avenue Fire Department built their own pavilion in 2000 and the Middle Grove Fire Department built a two story storage barn in 2004. The early years of the district are filled with stories of fighting fires without equipment. Back then members fought fires with their own clothes, without radios, pagers, and other, what is now perceived as common tools to combat fires. Often alarms in the early morning in sub-zero temperatures would cause the pumps to freeze and equipment to fail, and the firefighters would be left with nothing but ingenuity to fight fire. In an age of state-of-the-art fire trucks, bunker pants, boots, helmets, air packs, and gloves, its hard to imagine fire fighting today without these necessities. Find out more about the Greenfield Center Fire Company here. 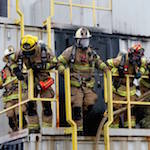 Find out more about the Porter Corners Fire Company here. The original Middle Grove firehouse was built on land donated by Richard Roeckle Sr. located on Middle Grove road a little north of the Stewart’s store. The firehouse was hand built by the membership but the membership later built a separate meeting hall in 1956 behind the firehouse with funds from loans that some of the membership took out on their own. Some members put their own houses up for collateral for the loan in order to make the meeting hall a reality. This meeting hall later was leased to the school district as a school house (for grades 1st through 6th) and also housed dances and supper fundraisers. The company moved into their current facility located on North Creek road in 1993. Find out more about the Middle Grove Fire Company here. The original Maple Avenue Fire Station was a school on what was then old Route 9. The school housed an 8-foot one-truck bay, which stored only one fire truck. Over the years the station grew to contain two trucks, then in the late 1960’s the members of the company constructed a large meeting hall. This hall would serve as a location for turkey, and spaghetti dinners, which the company used to raise funds for new equipment. The company soon built a large bay designed to house three trucks but eventually housed four trucks. This station was replaced in 1998 with a new larger station (100×100 square foot) north of the old original fire station. Find out more about the Maple Avenue Fire Company here. You can view more historical pictures of the Greenfield Fire District by visiting the historical photo archives section. Charter members are the firefighters who founded the Greenfield Fire District back in 1947. These individuals formed the first membership of the Greenfield Fire District. Much of this information came from fire company historians and from the Secretary’s Records of C.H. Brown; Paul M. Davis and Ernest Chamberlin.